Marlon Blackwell’s design of the Moore HoneyHouse was one of five designs chosen for the international ar+d awards. The award is given to architects 45 years old and under, said Peter Davey, editor of The Architectural Review. About 700 entries were received from 60 different countries, Davey said. The HoneyHouse shares the award with four other designs located in Croatia, Germany, Japan and Australia. “The jury decided to give the small building an award because it uses materials with great sensitivity and sophistication, and it suggests new relationships between artifact and nature with the simplest of means,” said Davey. 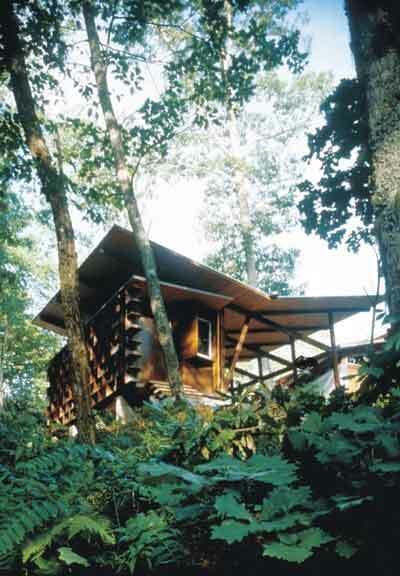 The HoneyHouse sits on Little Terrapin Mountain in North Carolina and serves as a carport and a storage and processing area for honey. Built from tongue-and-groove pine boards and rectangular section steel tubes, the structure preserves Blackwell’s trademarks: attention to detail and spectacular use of light. His detail work included weathering the steel for nine months to give it a rustic look and placing the structure on concrete block piers to allow proper drainage and prevent bug infestation. The HoneyHouse resembles a honeycomb. A single load-bearing wall fabricated from steel plates and faceted glass planes provides multiple reflected images of the surrounding forest. 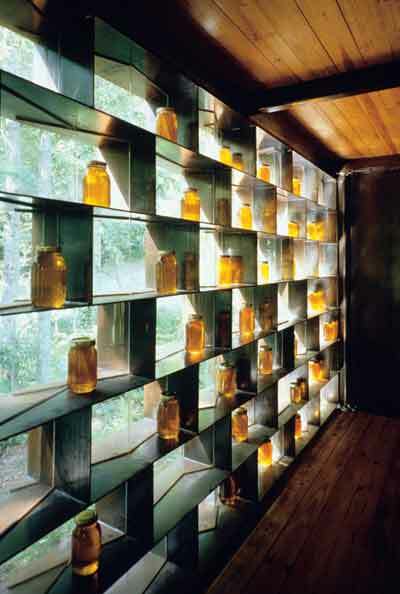 Within this wall made of voids sit jars of honey. The Royal Institute of British Architects in London displayed the winning design in March. PreviousWhy are some clouds white, while others are dark? NextKenaf: Coming soon to a store near you?